<?xml:namespace prefix = "o" /> Picnic tables provide families, students, and individuals with a convenient area for studying, conducting work, or to eat a pleasant meal. 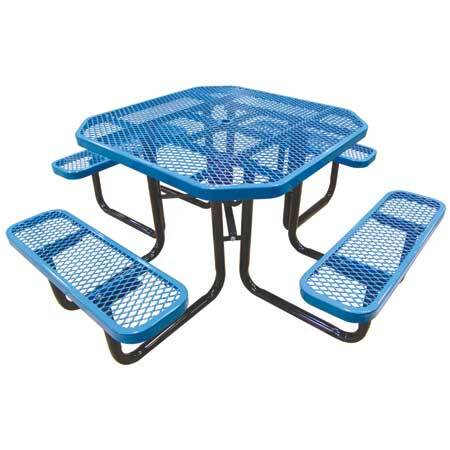 Square, circle, rectangle, and octagon picnic tables offer various sizes that fit different amounts of people. You will have no trouble finding the design that works best for your situation, no matter how many tables you need, the shape you want, or the color you prefer. Park tables are made to handle high traffic areas and won’t require the level of maintenance that other tables generally entail. A commercial picnic table, such as a lifetime rectangle picnic table, provides owners with a permanent in-ground outdoor table. Heavy duty metal with the understructure coated in black powder protected finish has perforated table surface and surrounding seats. A handicap table is also available in this style with an eight-foot permanent mount. Anti-skateboard tabs are sold to make sure the tables are only being used for what they were made for. Octagon picnic tables are available in two styles. The perforated octagon tables are made with heavy duty metal and a black powder coated understructure. You have a choice among four frame designs: portable, surface mount, in ground, and handicap. This allows you to choose what works best for your garden, park, or patio area. 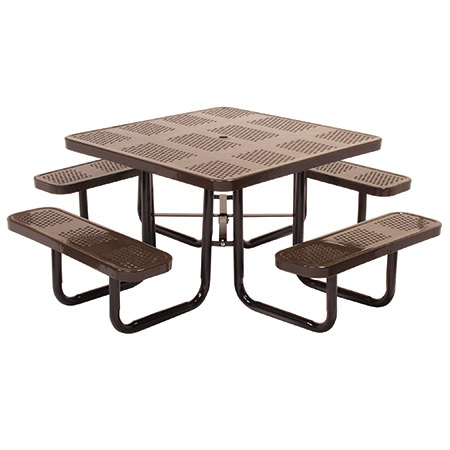 Octagon wire mesh picnic tables have a 46-inch diameter with expanded metal seats and tops. This style can be bought with an umbrella, leg protectors, and anti-skateboard tabs. Portable, surface mounted, or in ground frames are available. A handicap table in this style is offered with a portable frame. Park tables that are rectangular in shape come in various styles. Each design is available in different lengths so you can fit the table in its designated spot without overcrowding an area. 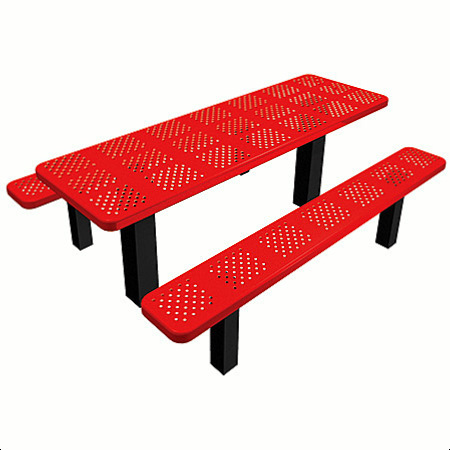 Perforated rectangle bench tables have surface mount or in-ground styles in four different lengths. Post mount rectangle outdoor tables come in two sizes and 16 colors. The expanded metal tops and seats give a unique look that is strong and sturdy. You can order anti-skateboard tabs with this design. 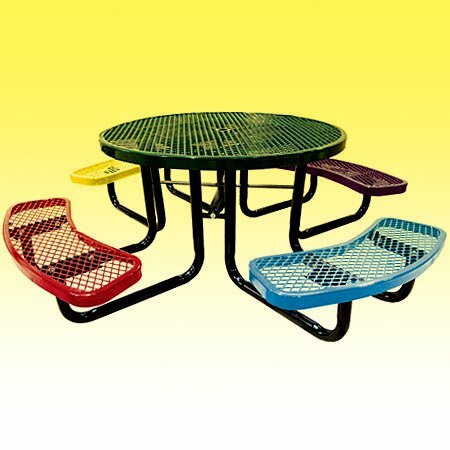 Children’s picnic tables come in fun colors and are small enough so children can safely use them. Multicolored Thermoplastic gives the outdoor picnic tables a weather resistant finish that can outlast children’s childhoods. Leg protectors are offered, as are umbrellas that provides ample amounts of shade during sunny days. Round outdoor commercial tables let friends and family enjoy Mother Nature and fun conversation with comfortable seating that lifts them from the ground. 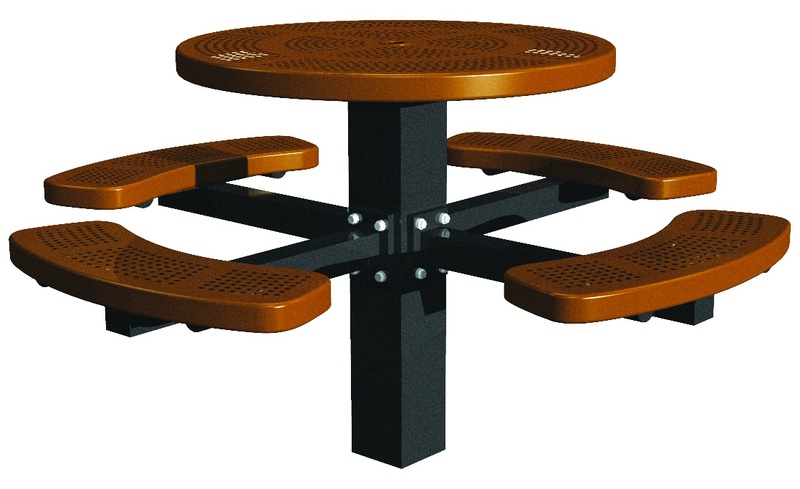 Post mount round picnic tables feature perforated heavy metal tops and seats. Round picnic tables come in 16 different colors that will last for many years without inconvenient maintenance requirements. Handicap round tables are available in designated frames, along with optional leg protectors. Umbrellas give your customers or guests a convenient area to get away from either sun or rain. With so many choices available, you will find the perfect commercial outdoor picnic table for your park, garden, school, or patio. You will find plenty of colors, lengths, and shapes to make it easy for you to come across the picnic table design you have been searching for. Cost effective theme park design requires investing in materials that will withstand the elements for several decades. Metal picnic tables ensure this savings pay back ROI through reduced repair and replacement costs. Three different ways to mount outdoor picnic tables provide convenience and maximum security. 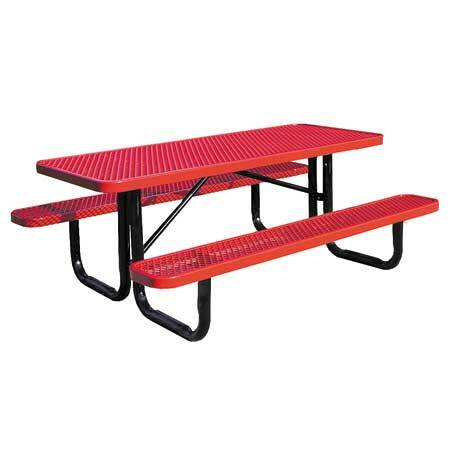 X P B Locker and Supply carries a large selection of picnic tables at affordable pricing. We have a large selection of Commercial Park Benches and Metal Outdoor Picnic Tables at Discount Direct Factory Sale Prices. Picnic tables are tables that have built-in bench seats. They come in many sizes and shapes to accommodate a wide range of applications in both indoor and outdoor environments. They are used in residential backyards, parks, public squares, indoor food courts in malls, and school playgrounds. Kids picnic tables provide a fun, safe place for children of all ages to eat outside. Any area like a backyard, a patio, a deck, a yard, or a park can be an excellent place to set one up. It gives kids a special area just for them, and it is easy for them to get in and out of safely. The lifetime picnic table is so named because of its remarkable ability to coincide with the human lifetime. We are all shooting for a hundred, so we are fully confident that our picnic tables will be there to celebrate with us on our centennial birthdays.Come check our affordable prices. 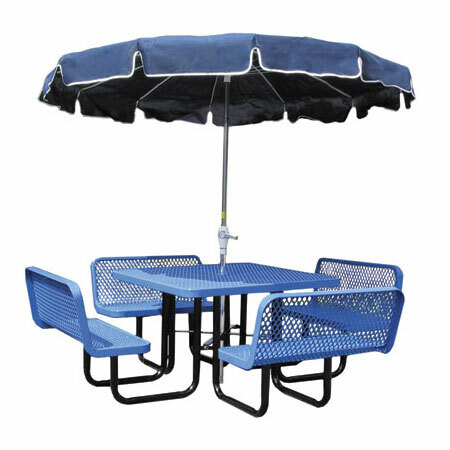 Our Oval Angle Iron Picnic Table is an attractive, durable, and modestly priced appropriate for any location. Commercial outdoor furniture is made to material standards that withstand high traffic areas and is durable enough to endure harsh weather conditions. We offers vibrant pieces that work well together at great prices. Children of all ages will love going on a picnic and having a colorful, yet safe, table to eat their food with friends and family. We offer factory direct pricing. Square commercial post mount aluminum metal picnic tables are ideal for outdoor and indoor dining. Aluminum picnic tables can be found in commercial dining restaurants throughout the continental U.S.